I am on the road and struggling to find mental space to gather my thoughts at the moment, but I don't want this to pass without comment from me. 1. I don't know how many people came, I tried to count and estimate, maybe around 200? Anyway, we packed the ballroom at The Gladstone Hotel in Toronto. I'm sorry that people had to stand, but you know you're onto a good thing when people decide to stay and listen to what is basically a lecture despite not having a place to sit. 2. 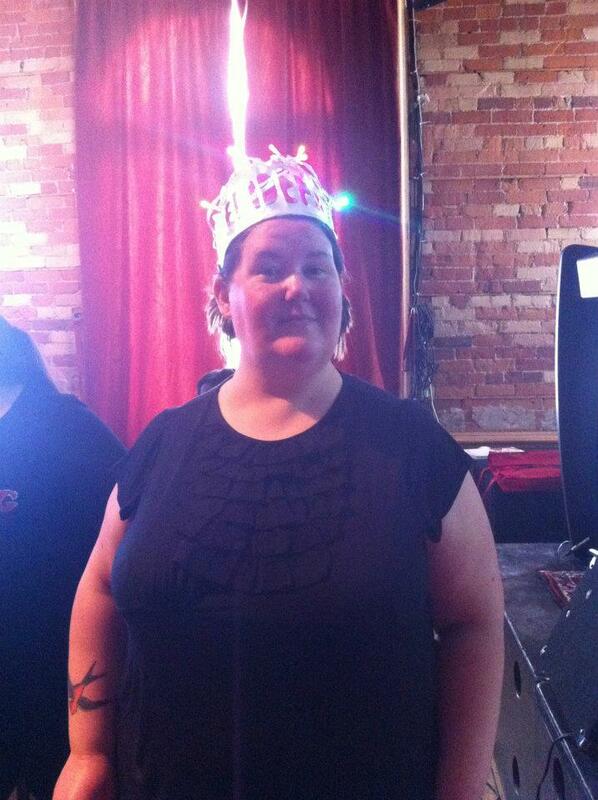 I have heard many people in Toronto say that there isn't much fat activism there. Yet this is a city that can pack out a ballroom to hear someone from out of town talk about fat. This proves that there is a constituency and an appetite for fat activism in the city. It means that if people want to do stuff around fat, other people will support it. This is very exciting. 3. I thought it was really great to speak and have a panel of diverse local fat activists talk about my work and make the space their own. They were: Onyii Udegbe, Gigi Basanta, Chelsey Lichtman, Michelle Allison, Nik Red, Jennifer DePoe, Alina Cubas and Tracy Tidgwell. I have become so irritable about activists who talk at communities that are not their own and start making demands without really understanding the local picture. Anyway, it felt like a really great dialogue and it gave me a lot of things to think about, especially Onyii's questions about what fat activism might look like for people who have experienced genocide. It made me hunger for more deep and thoughtful engagement with intersectionality. 4. It wasn't just the panel that made this a community event, there were many people supporting it, including an organising committee, volunteers, performers and party-makers, inter-departmental academics at Ryerson University, artists, and so on. It's really great when people in different worlds come together to make something. I love a good mixture of things. Many people at the event were very new to fat stuff, and others had much more experience, seeing them benefit from each other's presence was a total thrill. 5. I really love getting a giant cheer when I speak. I'm facing a big and scary personal transition at the moment, and need all the encouragement I can get. It will be a long time until I forget the sound of the fat activists of Toronto cheering me on. Thanks everyone. Headless fatty: why do the same ones keep popping up? 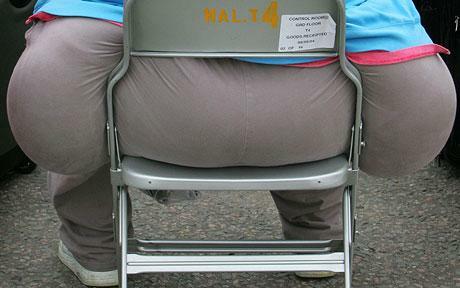 Very briefly, I've noticed how the same headless fatties turn up again and again in fat panic news stories. I see these two pictures all the time: golddigga and big-arse-small-chair. Today golddigga accompanied a story about The Food and Drug Administration's approval of a new diet drug, Belviq, in the US. I've seen that picture illustrate other obesity epidemicTM stories too. I'm interested in what makes them so alluring to picture editors. My gut reaction is that big-arse-small-chair freaks the normals out because, faced with a big bum, all they can do is identify with the chair. 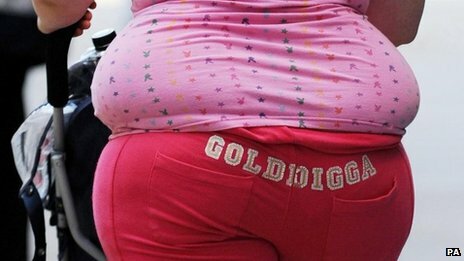 Golddigga isn't particularly fat, in my opinion, but it’s the intersection of implied unrepentant chavviness and single motherdom that makes the use of the image so full of hate. I appreciate it's also about how pictures get sold and used in news media, for example there is probably a pool of images available to editors, and this is based on the deals that news providers have with picture agencies. I've been co-organising an event called the Fattylympics. This is a non-commercial, community-based afternoon of messing around in the park. It's fat activism and, because I'm always interested in mixing it up, it's about other stuff too, namely the 2012 Olympics, which is happening in, and destroying significant chunks of, my neighbourhood in East London. One of the forms of fat activism that I enjoy very much is about creating a platform from which many different things can emerge in unexpected ways. The Chubsters is an example of this, it's supported workshops, filmshows and even stonemasonry. I like fat activism with which people can engage in their own ways, where people make their own meanings out of things. I think it's great to draw on people's talents and the things that they like to do, and are really good at. It helps build community and encourages people to think about fat stuff creatively in whatever way it intersects with their own lives, and pass it on to others. The Fattylympics is also in this vein. It's a satirical Olympics, it will take place on a particular day in London, but I also see it as space from which people can make stuff in their own way, to make something bigger and more complex than I could ever have imagined or produced by myself. Some of this has come about by inviting people to contribute, for example. I knew that Bad Artists Becky and Corinna would make a great job of the Fattylympics mascots, and they did by coming up with the sublime Egg'n'Spoon. Other people have volunteered things, including performances and events. One person was the musician Verity Susman, of Electrelane, who also has solo projects in her own name. Verity volunteered to write the Fattylympics Anthem and this she did, using words that I wrote. I really love her music in general, so it was a great experience to make something with her. When I imagined the Anthem I thought about something that people could sing regardless of whether or not they were actually able to come to the Fattylympics. I wanted something hopeful and warm that people could hum when they needed a bit of strength. Although the Fattylympics is a big joke in many respects, I also wanted something heartfelt on the day. The Anthem is also released under a Creative Commons licence so people are actively encouraged to share and remix it. I'm hoping that people might video themselves singing it, perhaps with a group, or that they'll remix it, and that this can add to the project's archive. We'll be singing the Anthem on the day at the Opening Ceremony. There will be a group of us singing it as a choir, though everyone is invited to join in. Why not have a sing? A few weeks ago I came up for air from thesis-writing and got excited to see that a new fat activist collective has formed up north. I had to know more, so I asked some questions. Hi! I'm Kirsty and I'm answering these questions on behalf of the Yorkshire Rad Fat Collective, which is a newly founded group that meets and runs events in Leeds, West Yorkshire. I am otherwise found at http://fattyunbound.blogspot.com. We're really new as a collective (we only had our first proper meeting the other day). Emily and I began by organising a couple of fat clothes swaps in Leeds, which have gone really well and gave us a sense of the importance of creating a body positive space where everyone is welcomed. We decided to run a clothes swap because we'd seen similar things going on in London and wanted to bring the fun up North. We'd both gone to local swaps and been frustrated at the lack of plus size items, so we decided to run our own. After the second swap, there were calls for us to start a Facebook group so we could all keep in touch outside of the swap, to talk about politics, resources, clothes and our own local experiences. Now we're meeting up reasonably regularly and planning other things that we can do as a group. Lots of things! We'd like there to be more clothes swaps, of course, but we're also focused on forming a community where we can share skills, strategies and resources for other awesome fat people. Things we are planning immediately include an open blog (this has *just* been created at http://radfatcollective.tumblr.com and is open to submissions from everyone!). We'd like to keep up reasonably regular socials, and are planning a day of fat swimming frolics soon which might even involve water slides (!). 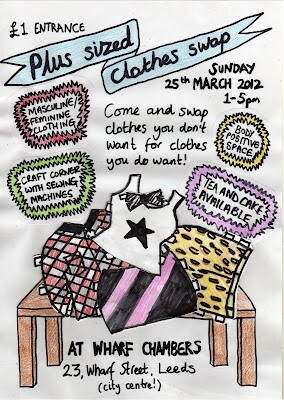 I'd also like to run a regular crafternoon where we can do more skills sharing. What kind of rad fatness might be associated with Yorkshire? I guess the main reason we're called the Yorkshire rad fat collective is because we wanted there to be a specifically fat positive space in Yorkshire. One of the things I love about Yorkshire is that it has a massive DIY focused community – people are much more able to do their own thing up here as it's cheap to hire spaces and possible to live on less money. I see this as informing the activism and community I'd like to build with the group. What does 'collective' mean to you? I guess to me, I see it as a space where everyone can make decisions and which is free of a hierarchical structure. All of us come from different backgrounds and have different skills and intersections between us and our bodies, so I see a collective as a space to bring together that difference in a way which (hopefully) still gives everyone a voice and provides a valuable support network to those who need it. Come and hang out with us! Join the group on facebook at https://www.facebook.com/groups/255778594515036/ and tell us what you'd like to see happen locally.